In the region $0 < r < R$, the magnetic field is non-zero. In the region $R < r < 2R$, the magnetic field is along the common axis. 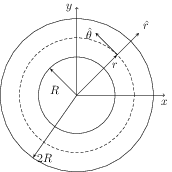 In the region $R < r < 2R$, the magnetic field is tangential to the circle of radius $r$ centered on the axis. In the region $r > 2R$, the magnetic field is non-zero.